New design: Can this be the future Parc des Princes? This concept is not a commercial vision of Parc des Princes redevelopment. It’s more of a voice in ongoing debate regarding the stadium’s future. How important that voice will be, that depends on the engagement of most interested parties: PSG, Paris city hall and famous creator of the existing structure, Roger Taillibert. With Euro 2016 around the corner, this vision addresses the question of post-Euro use. Long-term plan already announced by the club and supported by the mayor includes expansion of the stands. In one of his interviews, Roger Taillibert already expressed the will to approve such move, but he suggested staying within the size of 60,000 seats. This proposal goes further. The existing stadium is symbolic for French sport and entertainment, just as it is for architecture. This is why it requires a subtle, comprehensive approach. With its status of an icon any interventions have to be well conceived. According to the authors of this vision, Parc des Princes should retain its key features while also enhancing the visitors’ experience. Structurally this means keeping the sharp concrete “razors” in place, honouring the most distinctive feature of Taillibert’s work. The concrete roof however would be demolished to make way for a third tier of seating. An interesting contrast between existing and planned structures is created, where steel meets concrete, light meets heavy and new supports bloom like trees between the current frame of the stadium. It’s also a dialogue between architecture and urbanism of 1970s with current ideas. would such dialogue be possible at all? “The building is not listed as "monument historique". Modifications can be done on it with the approbation of its architecte R. Taillibert. However it's a strong symbol for the French sport and for the city. That's why our project keep the existing stadium and play with it. It will have been much easier and cheaper to destroy it and build a new one”, says Arthur Lapeyrère, one of the authors. 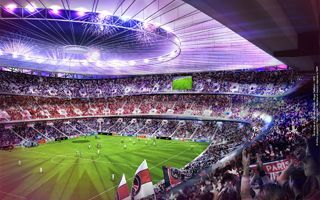 The proposal foresees an increase from 48,000 capacity to 75,000 (roughly 60%) to make the stadium one of the most modern and largest stadiums across Europe. Atop the new stands a lightweight steel cable roof is planned, solution already used in various stadia worldwide. Aside from new seating, overall floor surface of the stadium would go up by over 60%, including commercial offices (33,000 square meters), hotel (12,000 sqm), club museum and megastore (4,000 sqm together) and greatly expanded hospitality zone with some 7,500 business seats in total. According to the designers, revenue may go up by 236%, ticket sales alone going up by 56%.